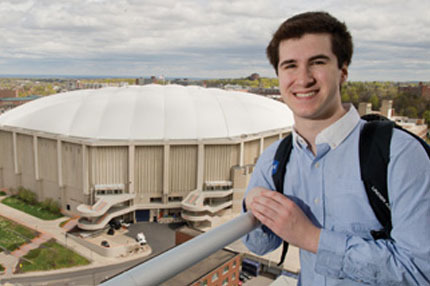 For Newhouse student Alex Kline, it’s becoming commonplace. Kline, the creator of the ubersuccessful The Recruiting Scoop on Rivals.com, has again been named to the Forbes 30 under 30 list. Forbes rarely hands out repeat honors. It has done so with Kline, who continues to find a good blend of school and professional life to reach new heights. Despite his busy schedule, he did have a few free minutes recently to answer some questions about how he makes it all work. Q: How did you find out about the most recent honor? A: Forbes emailed me about a month before it came out asking what I had done this year. They typically don’t have a lot of repeats on the list, but I essentially had to make my case. Once I did that, they notified me a week before it came out saying I had made it. Q: You started your own basketball recruiting website when you were 15, sold it to Yahoo, and have been honored by Forbes and Sports Illustrated magazine. How do you stay grounded? A: What originally made me successful was being a happy-go lucky person who came out of nowhere and was simply positive about everything. As the success started building up, I noticed a bit of a change in myself. Some good, some bad. Because I’ve been put on a pedestal from an early age, it can frustrate me when I’m stuck doing the same thing, or not working my way up the ladder of success. But in all reality, I’m totally beyond blessed to be where I am right now—at Syracuse University, with great friends around the world, a clean bill of health, a great establishment at an early age and much more. It’s time to start caring about the little things and appreciating every day as I should. From now on, I’m changing my outlook on life and staying positive and thankful for both the good and bad in my life. Q: A lot of your energy goes into the Mary Kline Classic, a basketball tournament in honor of your mom, who passed away at a young age. How much time do you devote to it? A: Hours and hours. I control all aspects of the event, and while it’s all about maintaining things, I look to enhance everything as much as possible. When the event goes well, I find the flaws in it and fix them so that they are perfect for the next year. The second year, the event was probably as close to perfect as it could be, but still not where I wanted it to be. The amount of time I put into all aspects, from recruiting players to marketing to raising money to finding sponsorships to locking down game day operations and much more is pretty crazy and consuming. Currently, we are a bit behind in where I would like to be at a bit over $2,000 with May 31 over four months away. I am confident that we will be able to raise a lot more money as we get closer and as more sponsors come on board, but it can be daunting knowing the clock is ticking. The importance of this event is about raising awareness, and money. Everything else helps to build that up. A: Besides honoring my mother, I like the fact that this event always brings together so many people I know. It’s a reunion, essentially, of my basketball family, my high school and college friends, and everyone along the way. It’s pretty exciting to know that many people are willing to spend one of their days supporting you and what you’re doing. It also makes those people vulnerable in a good way. There are a lot of macho exteriors who never talk about their personal life. When that day does come around, it brings a lot of emotion out of people, and it’s amazing to see. One of the players who won co-MVP last year, Isaiah Whitehead, who is going to Seton Hall next year, told me after the game that his grandmother passed from cancer, so this was a great way to honor her. He is a very quiet and macho person who doesn’t necessarily force out his emotions, ever. For him to tell me that made me see a different side to him, and others, followed by him giving his jersey from the game to a younger kid and signing it. It’s the little things like that which keep this dream alive. Q: Any advice to those who are inspired by your story, and your success? A: My advice to a lot of people would come from the lesson I learned today. Besides the usual bit about “Don’t give up” or “Always follow your dreams,” I think the ultimate key to success is simply treating people well and valuing what you have. It is easy to say, “I want to be like that person.” Obviously, if one wants something, they will work their hardest to obtain it. There’s no question about that. But it’s how you go about it, how you treat others, how you present yourself before and after which can determine your success or failure. Being humble is easier said than done. Being appreciative is easier said than done. And being patient is easier said than done. Looking in the mirror and working on yourself sometimes is the best remedy to improve your chances of success. That’s what I’ve learned.